When’s The Last Time You 10RM’d? Pop quiz, hotshot- what’s your Deadlift 10RM? Do you know it without looking at your CrossFit btwb app or notebook? Before you check, what’s your Deadlift 1RM? I bet good money you know that one. Maybe you even have it tattooed on your chest, Memento style. If you are a CrossFit btwb member, that info is super simple to find and here’s why it’s important to check. 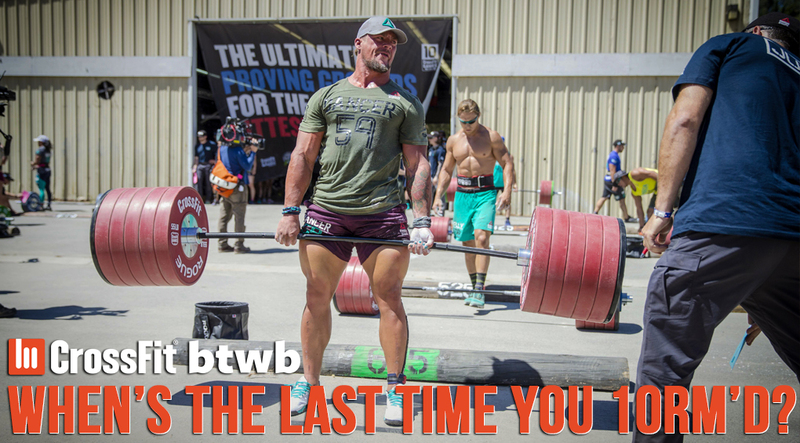 Looking at the numbers in CrossFit btwb, there are over 1,000,000 logs for 1 rep Deadlifts and a mere 355,021 for 10 reps. Basically, CrossFit btwb users have loaded a bar up as heavy as they could and given it the ol’ heave-ho roughly three times more often than testing a 10RM, or even just doing a set of 10. Now what does all of this mean? 10RM to 1RM strength can have a direct correlation to longevity and injury prevention, especially when lifting under metabolic duress. Most metcons using a barbell involve moving a weight significantly below 1RM threshold, and generally people run into trouble not during rep 1 or 2, but later in the workout when they are fatigued. If 1RM strength (the ability to move something very heavy) is disproportionate to 10RM (the ability to move something consistently as one reaches muscular fatigue), even lifters who normally set up well and have good technique will begin to deteriorate under the combined load/fatigue gut punch. Now, this is looking at the data pool instead of individuals, but it makes sense- the best CrossFitters are slightly better at moving “large loads long distances quickly” than they are at winning powerlifting competitions. As you get into the lower fitness levels, people who are likely more novice, you can see the ability to yank a heavy bar one time starts becoming stronger than the ability to maintain control and integrity for 10 reps. The “better” CrossFitters are better at consistently virtuous reps than the novices. This article isn’t meant to start an argument about who is good at what, or what is more important, rather to challenge you to take a look at your numbers and make sure you are developing your strength in a smart and balanced fashion. Lots of people keep track of their 1RMs and that’s about it- some CrossFit or lifting specific notebooks even have little areas for 1RM numbers. On CrossFit btwb, all of this data is just a few clicks or swipes away- on desktop or mobile just search “Deadlift” to navigate to your personal Movement Page for Deadlifts. In the app, you can even just tap the “Max Lifts” option on the homescreen to quickly access your main lifts and personal bests, activity, and Potential 1RM. Data is your ally, my friends, and we here at CrossFit btwb are committed to helping you use it to become faster, stronger, and healthier CrossFitters. Now, go load up that barbell and see what you’ve got!